L’Anse Manufacturing was established over 30 years ago with just a few employees providing manual machining services to the investment casting industry. The founder built a reputation for quality, customer service, and on-time delivery. He was known to go the extra mile – often driving more than 10 hours one way to reach his customers. That legacy remains with L’Anse Manufacturing even as we have grown and changed ownership. L’Anse Manufacturing now has 23 skilled employees operating state of the art CNC equipment and has multiple manufacturing partners to serve the changing needs of our customers across several industries. Click here to learn how our services can help you. Since 2006, L’Anse Manufacturing has been under the leadership of Mark Massicotte and Wallace “Buddy” Sweeney. Combined they represent over 50 years of experience, each bringing their own unique and complimentary skills. Both are devoted to quality, technology, and service. Buddy is a life-long Upper Peninsula resident and an L’Anse Manufacturing veteran of over 24 years. 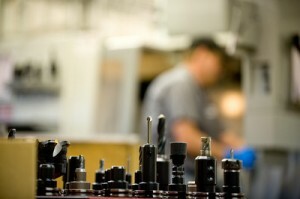 He is the in-house expert on machining and fixturing highly complex parts. Buddy has held numerous positions with L’Anse Manufacturing and has been leading the manufacturing team for 20 years. Mark has 33 years of experience fulfilling various engineering and manufacturing management roles for mid to large companies in the Detroit area. In addition to machining, he has broad knowledge of various fabrication and assembly techniques. Mark’s steadfast focus on customer satisfaction and expertise in finance, strategic planning, and distribution ensures that L’Anse Manufacturing operates effectively as a whole. Click here to watch a video about L’Anse Manufacturing and who we are.